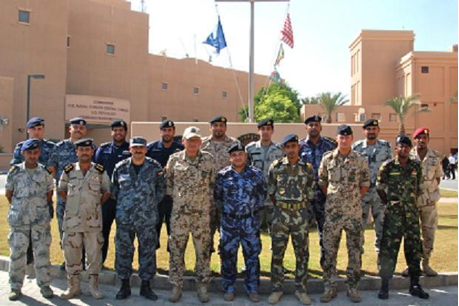 Following the recent success of Exercise Falcon Warrior 12-05, a maritime security training exercise for Combined Task Force 152, fifteen students from eight regional nations recently attended the Combined Maritime Forces’ (CMF) inaugural boarding workshop in Bahrain 15-17 October 12. The workshop was a unique platform for the sharing of knowledge in this specialist area as it provided both classroom and practical training to those who actually conduct the boarding at sea, rather than those who simply direct them. The training was provided by members of the United States Coast Guard, the United Kingdom’s Royal Marines and senior members of CMF’s headquarters staff. On the first morning of the course, the students received an introduction to maritime interdiction operations, before a series of specialist briefings on the legal aspects which underpin a successful boarding and the intelligence assessments which lead up to a boarding event. That afternoon they learned first hand about the media repercussions which their actions could potentially evoke and then had a briefing from the Naval Criminal Investigation Service. The first day closed with a series of national experience briefings where the delegates shared their boarding knowledge and real-life experiences. This exchange of knowledge was vital as it helped all participants gain an appreciation of each other’s capabilities, which, in turn, helps with interoperability in the future. On the second day, the students attended a series of practical briefings which concentrated upon the more physical aspects of a boarding episode. Demonstrations ranged from how to handcuff suspects through to how to break into doorways and hatches. The final day was dominated by a succession of realistic training scenarios of increasing intensity using live training weaponry. These were conducted in a specialist boarding simulator which is designed to replicate the accommodation structure of a vessel at sea. The event was deemed a success by all involved; these sentiments were echoed by CDR(sg) Hans Kuhfahl, of the German Navy, the event organiser who said: “There was good output for all concerned with a high standard of training delivered with the support of the USCG and Royal Marines. This will prove invaluable over the coming months when the students put their new found skills in to practice out at sea in the next Falcon series exercise”.